Improv Tournament – Happy Merry Chrismachanakwanzaakah! 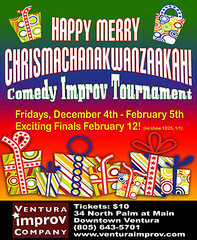 Home » Events » Improv Tournament – Happy Merry Chrismachanakwanzaakah! Exciting Finals on February 12! Get your Fa-La-Las out! Celebrate the holiday of your choice at this multi-week tournament of hilarity! Our improv teams will explore the ups and downs, ins and outs of the holiday season….while vying to be number one!